Bob Hughes was one of the five co-signatories of the 2003 No One Is Illegal Manifesto. He has been engaged in various campaigns against detention and in support of migrants and asylum seekers for the past 12 years, and is currently writing about what a world that took equality seriously would be like. He lives in Oxford. Should people be deported for being who they are? What if we were to scrap all anti-immigrant laws? 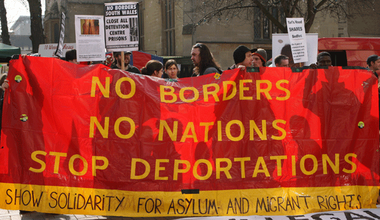 An Open Borders politics could kick-start the transformation of society.